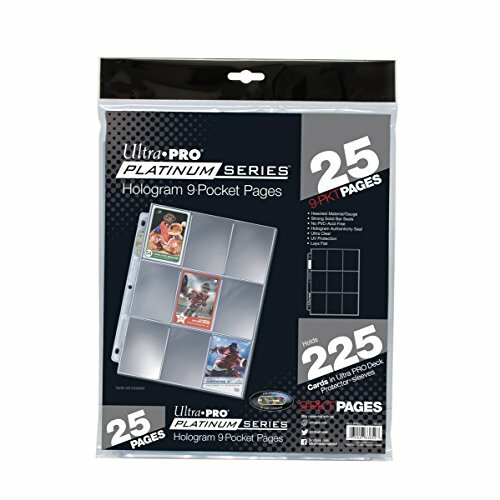 Holds standard sized cards with 2-1/2 X 3-1/2 dimensions or smaller. RAVNICA is under seige as Nicol Bolas and the planeswalkers of the Gatewatch face off in their epic final battle. New mechanic AMASS and returning favorite PROLIFERATE both help strenghten your creatures with +1/+1 counters. War of the Spark is the follow-up to the hit Magic: The Gathering (MTG) expansions GUILDS OF RAVNICA and RAVNICA ALLEGIANCE. 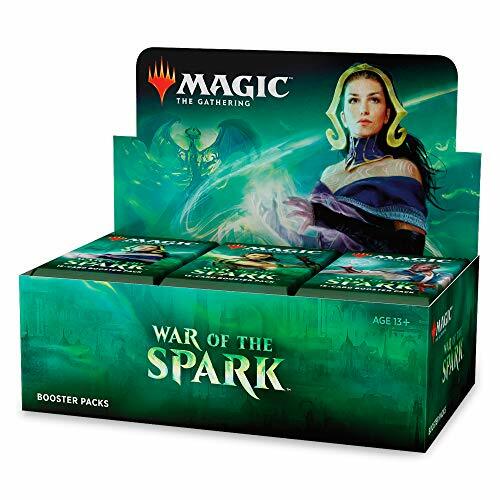 Your War of the Spark booster box includes 540 cards, including at least 36 planeswalker cards, to help FILL YOUR BINDER. The first modern collectible card game, MAGIC: THE GATHERING (MTG) has inspired more than 20 million fans over 25 years. WIZARDS OF THE COAST has been making the world's best strategy games for almost 30 years - Magic: The Gathering (MTG), Dungeons & Dragons (D&D), and many more. 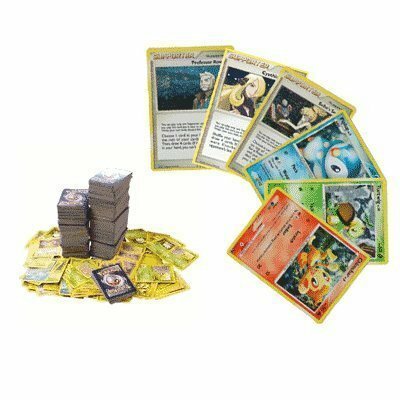 YOUR BEST VALUE ON POKEMON CARDS: Look no further for the best deals on assorted Pokemon cards. BOOST YOUR COLLECTION: Seven free Foil cards included with every purchase to add another level to your collection. LOTS OF RANDOM CARDS FROM ALL SERIES: You will receive a variety of regular and energy cards. Duplicates may occur. 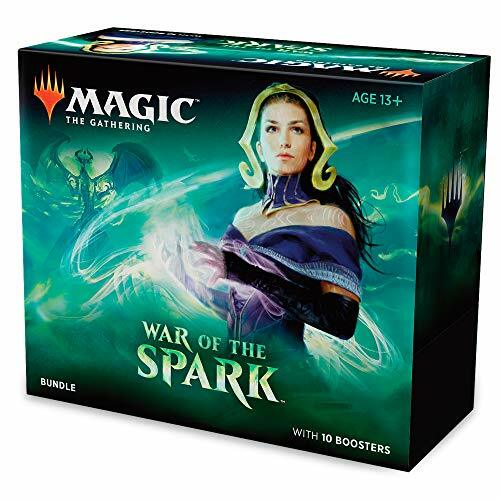 Your War of the Spark Bundle includes 10 booster packs with at least one PLANESWALKER IN EVERY PACK, 80 plus basic land cards, 1 Spindown life counter, and a player's guide. As excitement continues to build toward the May 10, 2019, theatrical release of Pok mon detective Pikachu, fans can check out some of the products that will be coming out as tie-ins to the eagerly anticipated live-action movie. Here's just some of the stuff you can look forward to! the Pok mon Trading Card Game will feature a special selection of 26 New cards inspired by Pok mon detective Pikachu. Collectors and competitive players alike will want to get their hands on all of these cards to inject a little ryme city flavor into their decks. 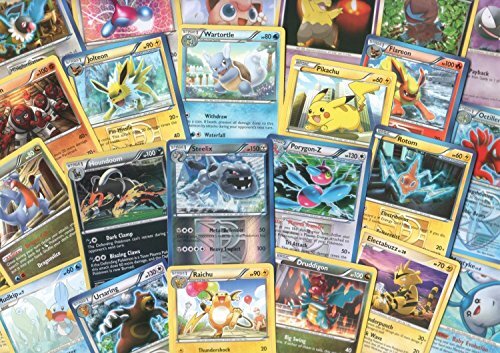 Look for cards featuring Pok mon such as Bulbasaur, Squirtle, Jigglypuff, and detective Pikachu, all depicted as CGI creations. 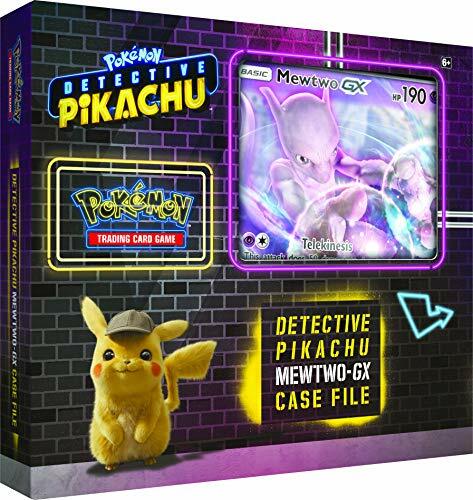 The first wave of Pok mon TCG: detective Pikachu products will be available beginning April 5, 2019. 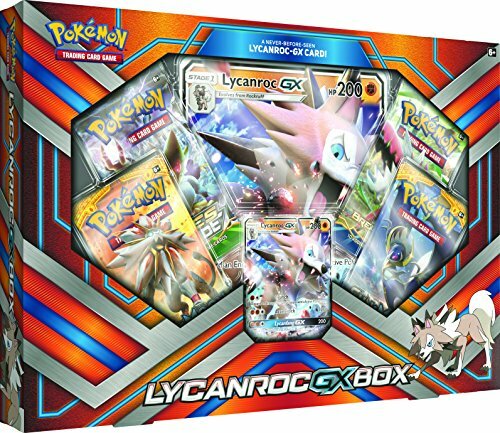 The Pokemon Lycanroc GX box helps you to jump start your collection. It comes with four 10-card booster packs, Each of which has at least one rare and may contain random foils. This pack's exclusive Lycanroc GX card is based on that character's midday form and features three powerful attacks. You get the promo in both regular and over-size versions. Use his lycanfang GX attack to deal 200 Damage to your opponent once per game and his other two abilities to reign supreme. This product is a wonderful gift idea for your favorite player. It also comes with a code for unlocking the cards for use in the online version of the Pokemon TCG. Collect and trade them all: propel your deck to victory and crush your foe's hopes! For standard size trading cards measuring 2-1/2" x 3-1/2"
Time for some serious Pok mon sleuthing because there's an amazing Pok mon detective in town! 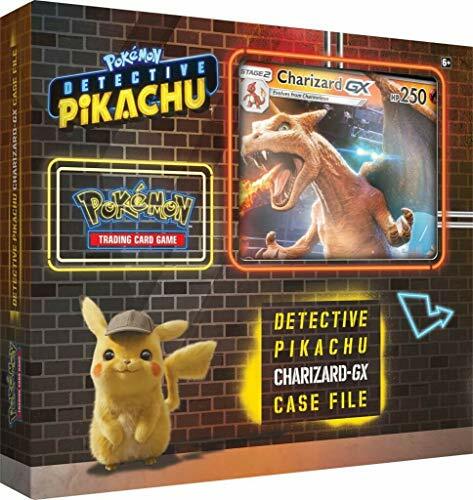 Celebrate the pok mon detective pikachu movie with the detective pikachu charizard-gx case file, including a foil promo card and an oversize card featuring charizard-gx both of them prized elements of any Pok mon TCG collection. And that's not all! You can tear into 4 special Pok mon TCG: detective pikachu booster packs, plus 2 additional Pok mon TCG booster packs to expand your collection to uncover a few more Pok mon from ryme city and beyond! A strange case in ryme city!time for some serious Pok mon sleuthing because there's an amazing Pok mon detective in town! 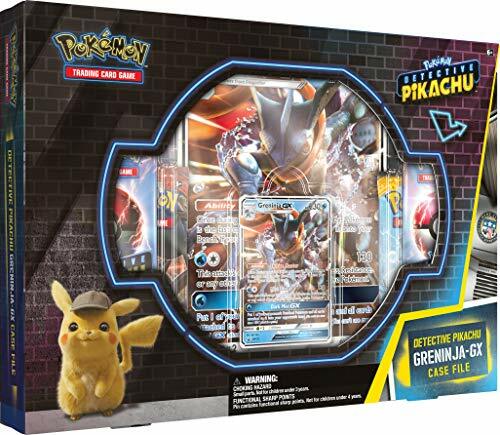 Celebrate the Pok mon detective Pikachu movie with a high-powered Pok mon-GX foil promo card and an oversize Pok mon-GX card both of them clear highlights of any Pok mon TCG collection. And that's not all! Tear into 4 special Pok mon TCG: detective Pikachu booster packs, plus 2 more Pok mon TCG booster packs to expand your collection to uncover a few more Pok mon from ryme city and beyond! Big Pok mon and little Pok mon both bring their own styled working together, they can take on Just about anything! Magical and wailord pair up as a tag team in this amazing collection, putting their skills together to challenge opposing Pok mon and discovering the power of two. 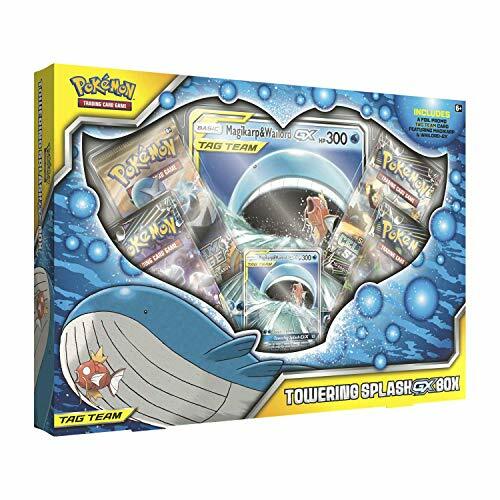 Witness this astonishing display of teamwork up close and add the tag team of magical & wailord-gx to your collection! 5 Pokemon Card Lot All Legendary GX Ultra RARES! NO Duplication! 1 Random Pokemon Coin! Includes Golden Groundhog Deck Box! 1. 5 Legendary Pokemon GX Ultra Rares! 2. 1 Collectible Pokemon Coin! 3. Includes 1 Custom Golden Groundhog Deck Box! This is a lot produced by Golden Groundhog, containing the custom storage box, featuring the smiling groundhog. LEGENDARY POKEMON - 5 Random Legendary Pokemon! No Duplication! COLLECTIBLE COIN - 1 Collectible Pokemon Coin In Every Bundle! GREAT ADDITION - English Near-Mint cards add variety to your card collection or deck! COMES IN GOLDEN GROUNDHOG STORAGE BOX! - Keep your collection safe in a High Quality Golden Groundhog Card Storage Box! Why choose Our carrying case for Pokemon trading cards? keep your Pokemon trading cards organized, dust-free and protected ! store it, when you're not. Keep your Pokemon trading cards organized, dust-free and protected inside this case. hand strap and carabiner design - it's very convenient to carry them with you wherever you go. compartments is adjustable> hard case with soft interior layer will hold all cards in one place and also protect the cards. include 1 removable divider for your convenience, It means that compartments are adjustable. the outside of this case is made from durable and waterproof PU material. It's tough and will not break, like hard plastic sometimes does. smooth and waterproof surfaces. It means that stains or water stains are easier to wipe, which makes your case look like as always new. phase 10 card game and much more. 1* high performance Pokemon trading cards case. worry-free 12-month warranty and 100% money back guarantee. 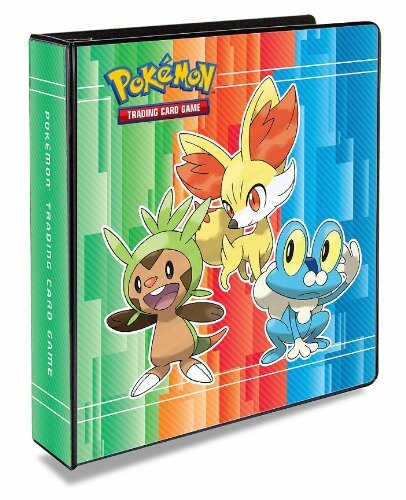 Note: case only, Pokemon trading cards are not included. 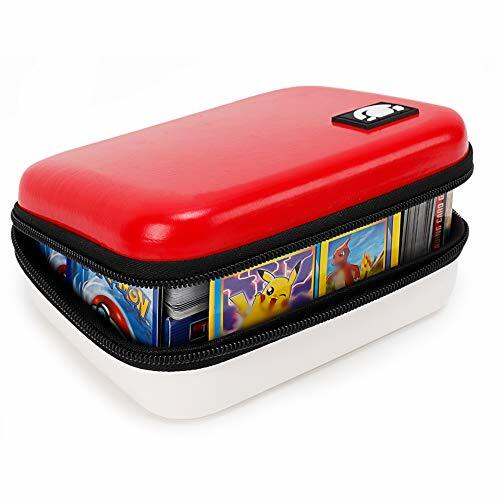 Travel and storage - keep your Pokemon trading cards organized, dust-free and protected inside this case. Store it, when you're not. Hand strap and carabineer design - it's very convenient to carry them with you wherever you go. Waterproof and shockproof - the outside of this case is made from durable and waterproof PU material. It's tough and will not break, like hard plastic sometimes does. Smooth and waterproof surfaces. It means that stains or water stains are easier to wipe, which makes your case look like as always new. What you get - 1x high performance Pokemon trading cards case by DACCKIT. Worry-free 12-month warranty and 100% money back guarantee. Beautiful and Compact card case for kids to carry around wherever they go, be ready for play and trade at all times. 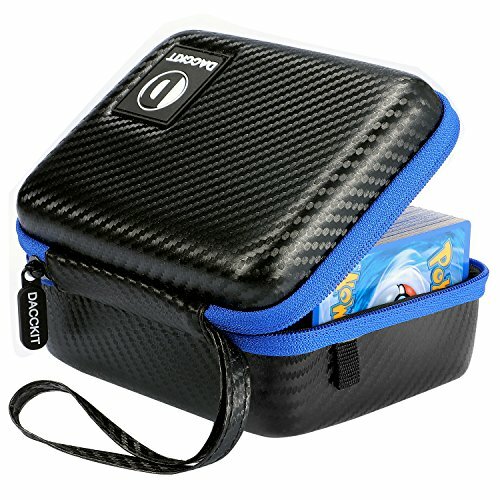 TRAVEL AND STORAGE - Keep your Pokemon Trading Cards Organized, Dust-Free and Protected inside this case. The Outside of this case is made from Durable and Waterproof PU material. Smooth and waterproof surfaces. Hard Case with Soft interior layer will hold all cards in one place. And also protect the cards. Hard Case with Soft interior layer will hold all cards in one place. And also protect the cards. 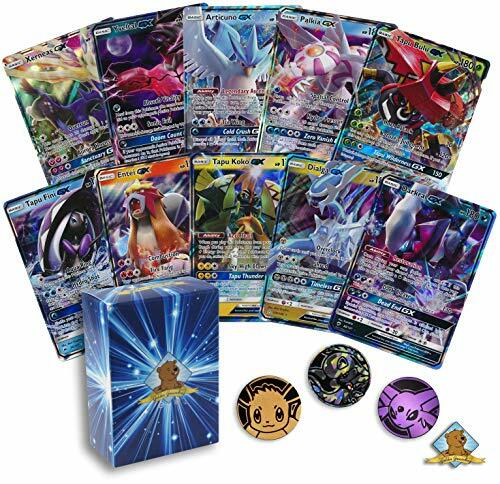 YOUR BEST VALUE ON POKEMON CARDS: Look no further for the best deals on assorted Pokemon cards. LOTS OF RANDOM CARDS FROM ALL SERIES: You will receive a variety of regular and energy cards. Duplicates may occur. BOOST YOUR COLLECTION: With random cards from every series, each lot is a surprise. BOOST YOUR COLLECTION: With random cards from every series, each lot is a surprise. The pictures are example of cards you may receive, not necessarily the exact cards you will receive. You will receive the following: 1.) 100 Pokemon TCG cards spanning multiple generations. 2.) 10 Reverse Foils 3.) An instructional card with instructions on how to play the Pokemon TCG. This lot was created by The Only Game In Town (tm). 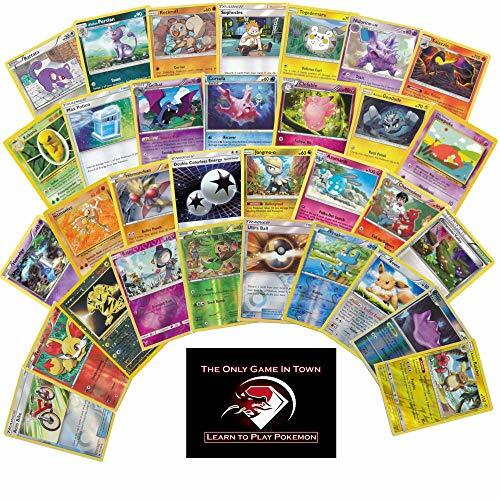 This lot of 100 random Pokemon cards and 10 foils is perfect for an aspiring Pokemon trainer or a seasoned player looking to bolster their collection. The 110 Pokemon cards you will receive span multiple Pokemon generations from first generation to current and will include little to no duplication. Each lot will include a special card from The Only Game In Town that will provide instructions for new players to learn how to play the game. You will receive cards in Light Play to Near Mint condition that have been verified to be from The Pokemon Company International and have been authenticated by our team with over 20 years of experience in authenticating collectibles. A must have for Pok mon collector's. whether you are just getting started with your Pok mon collection or already are a renowned Pok mon collector; get this card holder by Rayvol. Perfect fit: comes with 2 removable divider for your convenience and extra pocket to fit up to 400 Pok mon cards. 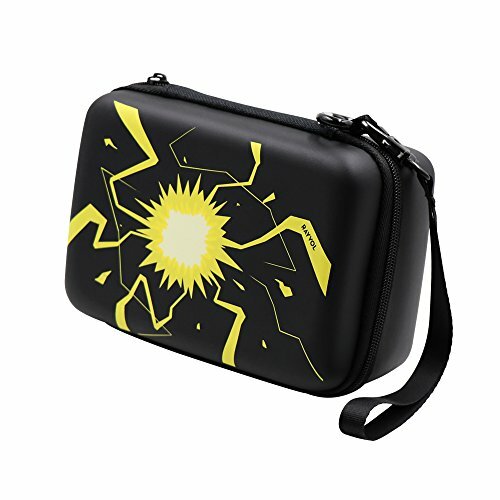 Thunderbolt themed carrying case to store and showcase your awesome Pokemon card collection to friends and family. Keep cards well organized, dust-free and protected inside this case. No more worrying about losing, bending or breaking a card. You can also store cards with standard card sleeves (without dividers). Small and compact card case as a gift for kids to carry around wherever they, Be ready for play and trade at all times. Easily toss this card case in a backpack and go. Includes a wrist strap and a carabineer clip onto a backpack. Hard case with smooth waterproof PU exterior and soft interior layer, which protect your cards from scrape or dirtiness, and it's sturdy and durable. 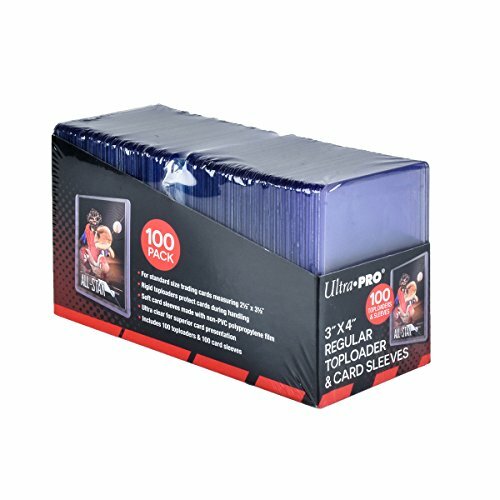 100% money back guarantee: if you are not 100% satisfied with your card carrying case for any reason, we will replace it or issue a full refund. 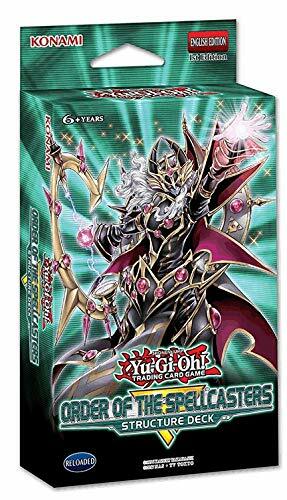 The magical Masters of structure Deck: order of the spellcasters have transcended the need for physical forms and gained the ability to become spells themselves! As pendulum monsters, they can be played as either monsters or spell cards, and have different abilities depending on which you choose. With most pendulum monsters you have to choose between playing It as a monster or a pendulum spell, and once you decide, you can't change your mind. With the new pendulum monsters from structure Deck: order of the spellcasters, you don't have to worry about playing your monsters as spells because they all have effects that summon themselves from your pendulum zones! After all, what good is being able to convert yourself into pure magical energy if you can't regain your body later? 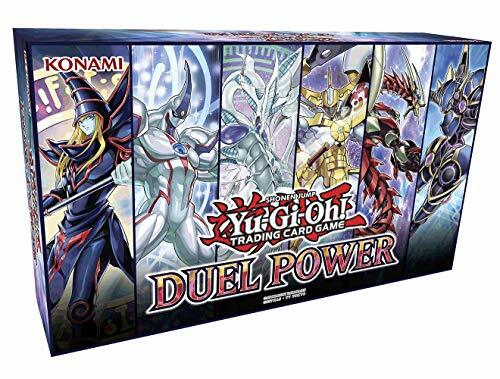 This structure Deck uses the same "spell counter" System as the spellcaster's command structure Deck and the "mythical beast" Monsters from extreme force, so cards from all three can be combined together to create an even more powerful Deck! Tag team Pok mon are here, brand-new cards that feature paired-up and powered-up Pok mon! 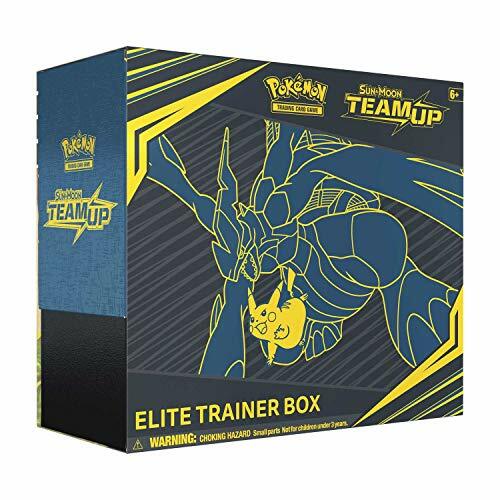 The Pok mon TCG: Sun & moon team up expansion offers many amazing battle teams including Pikachu & zekrom-gx, plus Lycanroc-GX, Hoopa-GX, Cobalion-GX, and more! When the teams put their moves into motion, It's a total free-for-all. Check out the awesome action and dynamic duos in the sun & moon team up expansion!